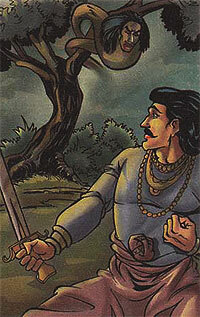 This time Vikram caught Betal before he reached the tree. Betal began yet another story. Bhupati was a rich man who had a son named Chander. His servant Bhola had a son named Suraj. Chander was spoilt and did not do well in studies. Suraj worked hard and performed well. Bhola wanted to send Suraj for higher studies. For this he tried to borrow money from his master. But Bhupati refused to help. One day, Bhupati overheard a conversation between Chander and Suraj. Chander said, "Why do you want to go for higher studies. I will give you some money to start a business." Suraj replied "I don't need money for anything else." Bhupati went home and gave Bhola the money. Betal asked Vikram, What made Bhupati change his mind?" Vikram answered, "Bhupati realised that Chander was getting jealous of Suraj. If he sent Suraj for higher studies, Chander would work hard to compete with him." Betal said , "You are a genius," and flew away.